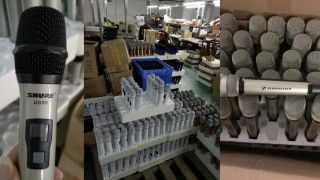 A police raid on a factory in China manufacturing counterfeit products—Enping Soundpu Electronics Equipment (also doing business as Voxpu Electronics Equipment)—was conducted in October 2018. In addition to Shure, other leading audio companies were impacted by the counterfeit operation, including Sennheiser, Yamaha, and Harman. Amongst the goods seized were wireless microphones and receivers, consoles, amplifiers, and processors. Shure has taken steps to initiate a criminal prosecution against the owner and managers of Soundpu, given its continued counterfeiting activities and blatant disregard for intellectual property rights. “Counterfeit products do not just exasperate customers by delivering a bad experience that does not reflect the promise of the brand," said Daniel Sennheiser, co-CEO of Sennheiser. "These cheap counterfeits also fall short in terms of quality and, in some cases, dangerously so. This damages the industry as a whole and we welcome joint action against violations in order to better protect consumers." “Yamaha has long taken various measures against counterfeit products such as civil actions, police raids, suspensions from customs, and placed enlightening advertisements globally, particularly in China,” added Takuya Nakata, president and representative executive officer of Yamaha Corporation. "We have done so because we firmly believe that these activities will not only protect our valued customers and end users from low-quality counterfeits but also lead to an improvement of reliability and trust in our brands."